Client applications are identified by a ConsumerKey and Secret pair. Sometimes these are referred to as client_id and client_secret. Access Tokens in the old world have a 12 months expiry period and refresh tokens live forever. 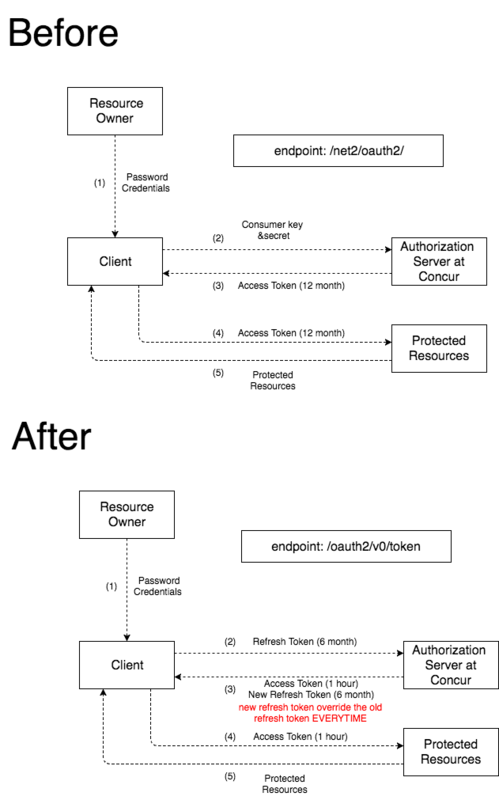 This is typically not a good security practice and goes against the Oauth2 standards. Tokens that are being used by clients today are issued for WSADMINs, meaning all tokens have administrative access. Unlike the old world auth, access tokens have a 1 hour expiry and refresh tokens have a 6 months expiry. This is in accordance to the best practice of using short lived tokens. This would mean that clients would need to perform token management. Work with SAP Concur’s implementation team to obtain a new oauth2 client_id and client_secret and to define the scope of client’s application. Process will take no longer than 48 hours. Implementation Team will respond with new client_id, client_secret, company’s refreshToken and expiry date. Client stores and configures application with this info. Client applications should store the following tokens and data in their application. Refresh Token: This token can change although most of the time this value is the same. Client applications should treat all returned refresh tokens as new values and overwrite the stored values with the new values you get from the response. Refresh Token Expiry: This date should be checked by a daily script and ensure that a refresh_grant is made to keep the refresh token alive indefinitely. If company policy dictates that the token should be allowed to expire, then you can skip this step. Once a refresh token has expired, clients would need to contact SAP Concur’s Implementation team to get a new company token. All APIs within SAP Concur require the calling application present an accessToken in the Header using the “Bearer” keyword. Since accessTokens have a one hour expiry, clients would need to get a new accessToken before any API call is made. In order to obtain a new accessToken, clients should call Oauth2 using the refresh_grant and providing the old refreshToken and other additional fields. Overwrite the existing refreshToken with the new one. There are a few error codes that client applications should be aware of. 403 Forbidden: Requesting for tokens for users who cannot be requested for. Usually for companies that are not authorized by their administrators. The bulk of errors will be returned as 400 errors and the response contains a code and description. Client applications should look for these values to determine what to do next. 16 User lives elsewhere There will be a geolocation field in the response to this error message. Use this as the base URL and retry the call. 54 Invalid Scope requested scope exceeds what is permitted.